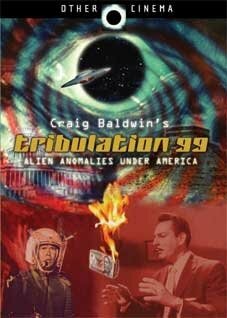 Upon its release in 1991, TRIBULATION 99 became an instant counter-culture classic. Baldwin’s “pseudo-pseudo-documentary” presents a factual chronicle of US intervention in Latin America in the form of the ultimate far-right conspiracy theory, combining cUpon its release in 1991, TRIBULATION 99 became an instant counter-culture classic. Baldwin’s “pseudo-pseudo-documentary” presents a factual chronicle of US intervention in Latin America in the form of the ultimate far-right conspiracy theory, combining covert action, environmental catastrophe, space aliens, cattle mutilations, killer bees, religious prophecy, doomsday diatribes, and just about every other crackpot theory broadcast through the dentures of the modern paranoiac. A delirious vortex of hard truths, deadpan irony, and archival mash-ups – industrials, graphs, cartoons, movies from Hollywood B to Mexican Z – TRIBULATION 99 constructs a truly perverse vision of American imperialism. ROCKETKITKONGOKIT: This kaleidoscopic collage-essay traces an alternative history of post-colonial Congo, the CIA, and military adventurism. WILD GUNMAN: A dense montage of cowboy iconography, advertising campaigns and pop culture imagery within an interactive penny-arcade game.